EuRA is the professional industry body for relocation providers and affiliated services. As a non-profit organisation EuRA aims to promote the benefits of a professionally managed relocation to companies with globally mobile employees. The theme of the sold-out 2019 EuRA International Relocation Congress is “Celebrate the Future | Opportunity Defined”, focusing on the opportunities that change can bring. Each year EuRA works hard to deliver exceptional learning and networking opportunities and this 2019 gathering of relocation and mobility professionals will be no different. 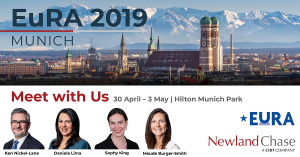 Join Newland Chase’s global mobility and immigration experts for this exceptional programme of training, breakout and plenary sessions and keynote speakers.